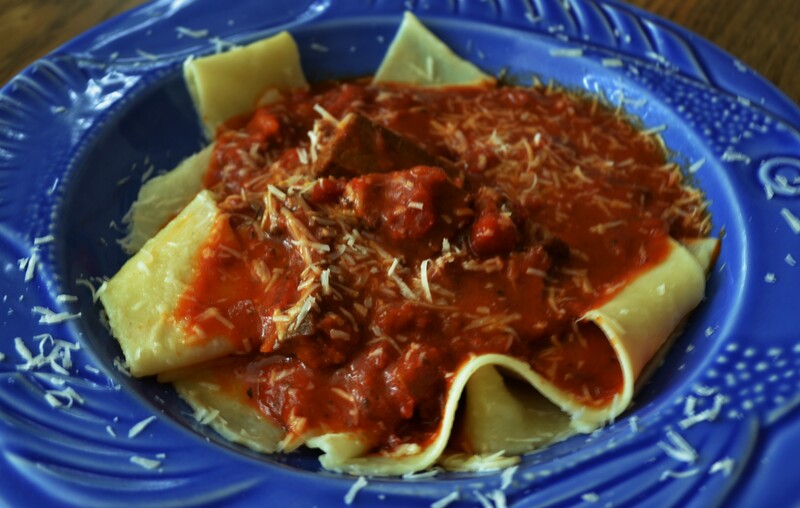 What do you get when you put two of mama’s best comfort foods — pot roast and marinara/ pasta — together? This has to be one of my all-time favorite creations using any left-over beef you have in the fridge from pot roast to steak. (I had some grilled flank steak left-over that I cut into pieces and used for this recipe. ) The addition of wine and beef broth (or Lipton onion soup, which is what I had on hand) and splash of heavy cream creates an extra layer of homey warmth to a traditional marinara. The wide Pappardelle noodles create the perfect nest for this dish. 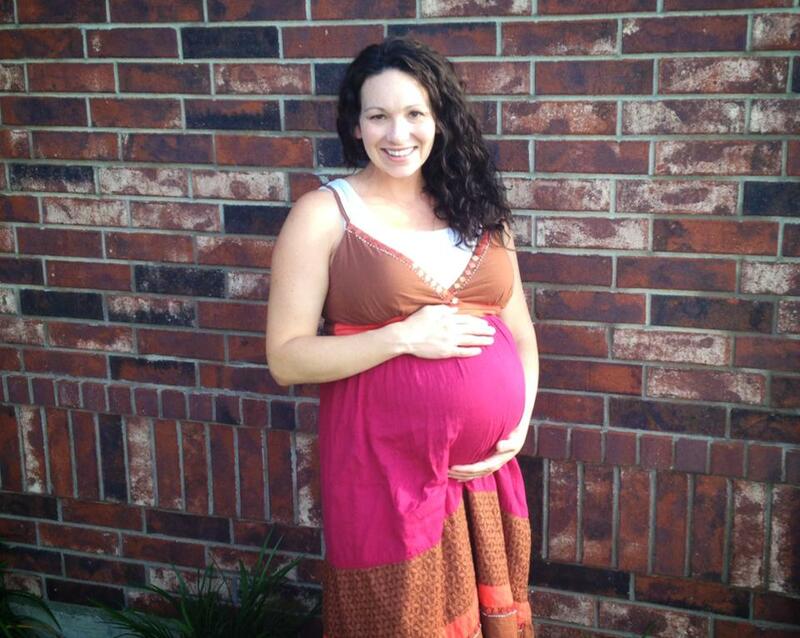 I am about to head to my daughter Rachel’s home in Texas this weekend awaiting the birth of her second child, a little girl (!) who will be named Corabelle. While Rachel is busy and recovering and nursing a newborn, I plan to whip up some comfort food with the help of my sous chef, Corabelle’s big almost-4-year-old brother, Jackson. Rachel and Jared are still mostly vegans, so I will often make things like rice bowls or pasta dishes that are easy to tweak for vegans and carnivores alike. At Rachel’s house, I am going to try subbing Miso for the beef broth. (Miso is the closest thing I have found to bringing out a “meaty” flavor in vegetarian cooking. In fact, I love the butter, savory flavor that Miso imparts so much that I often add it to meat-based dishes to upgrade the richness. ) I will probably substitute my favorite vegan meat, Field Roast sausages, sliced and browned in olive oil, then sprinkled on top. (Other options: lentils; or chick peas, roasted in the oven first.) For creaminess, I will likely blend up some raw cashews with a little cashew or almond milk, or use use canned whole fat coconut milk. Either makes a nice substitute for a splash of cream! No matter how you tweak this dish to make it your own, I think you will love it and that it will soon become one of your go-to favorites! P.S. If you happen to be looking for some funny, uplifting, soul-and-body nourishing books to tuck in your beach bag this summer, you may enjoy one of our recent books! In a big skillet, add the crushed tomatoes, broth (or Lipton soup mixture), garlic, red wine, beef, and Italian seasonings and brown sugar. Bring to a low boil, then turn down the heat and simmer until it is the thickness you like for pasta sauce. Add salt and pepper to taste. Turn off the heat and add cream. 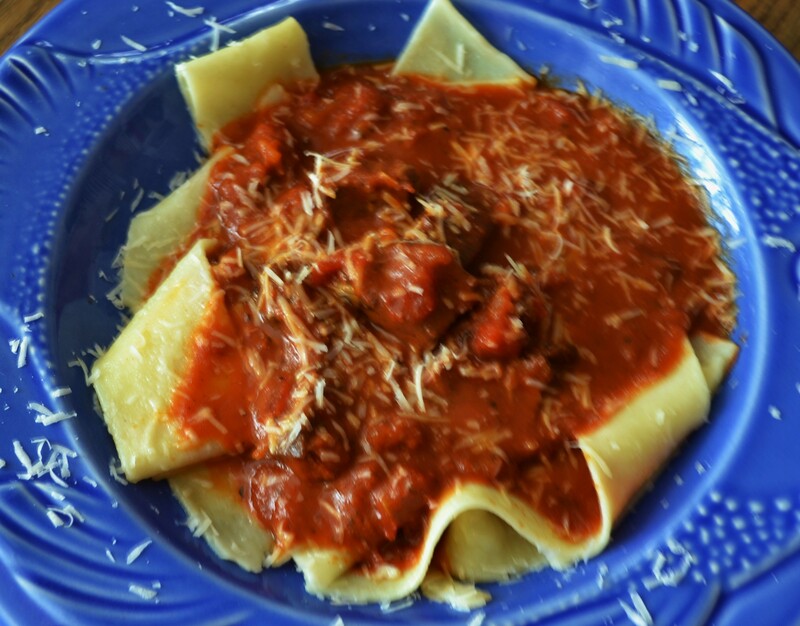 Ladle over Pappardelle pasta in low flat bowls, then grate Parmesan cheese over all. I am purposely messy with the Parm cheese as I think it makes the dish look rustic and beautiful. Variations: Add bits of cooked carrots, peas and potatoes to make this a one-bowl meal, and add to the “Sunday pot roast with veggies” feel. 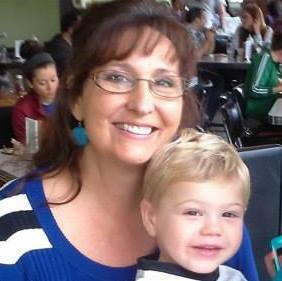 In early November, Greg and I arrived in sunny Southern California for a week of much longed-for and needed vacation. I took no time in shimmying into my bathing suit (and immediately donning a cover-up), loading my tote bag with “beach reads” and a pair of sunglasses. I snapped a picture of the glistening pool, palm trees, blue sky and mountains in the distance, then posted it to Facebook extolling the joys of time away! Savored every moment of sunshine that first day of vacation, went back to the condo enjoyed a relaxing evening and fell asleep. The next morning I woke to find that my skin was hot, my body aching, my throat swollen, my head felt about twice its normal size, and my ears seemed stuffed with cotton. Greg too had caught the bug, but he had taken the flu shot earlier in the month, so his misery was limited in time and scope. I did not get the shot, so my misery knew no bounds. There was no doubt about it: I had the flu. I don’t really remember much about the next next six days of “vacation” as I spent most of it sleeping or on drugs. When I am sick, Greg does a fine job caring for me, truly he does. That entire week he was the one who braved getting out and going to the store, ferrying in rations of cold medicine, cough drops and canned chicken soup. But the truth is, I wish I could have a Well Me to take care of the Sick Me, because the Well Me makes a killer homemade chicken soup. 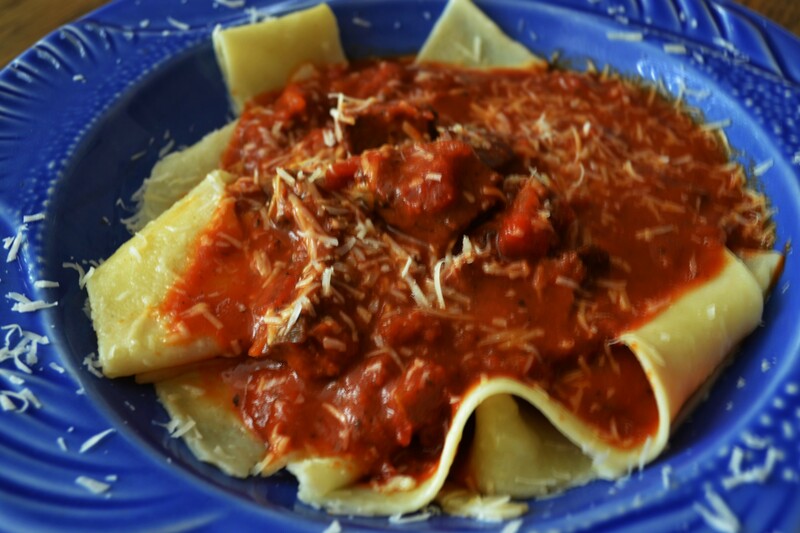 This one uses one of my favorite Trader Joe’s products: Lemon Pepper Pappardelle Pasta. 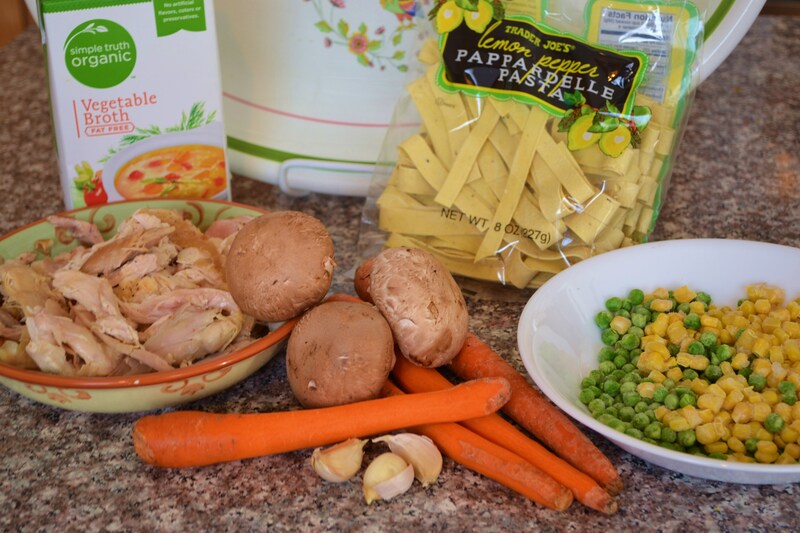 The lemon flavor is not overly strong and the texture of these noodles is perfect for chicken soup: firm but tender –a near-perfect pasta product! The great thing about this homemade soup is that it only takes 30 minutes to make but tastes like you’ve toiled in the kitchen all day. The special noodles take it to a “gourmet” level that you would be proud to serve to guests. 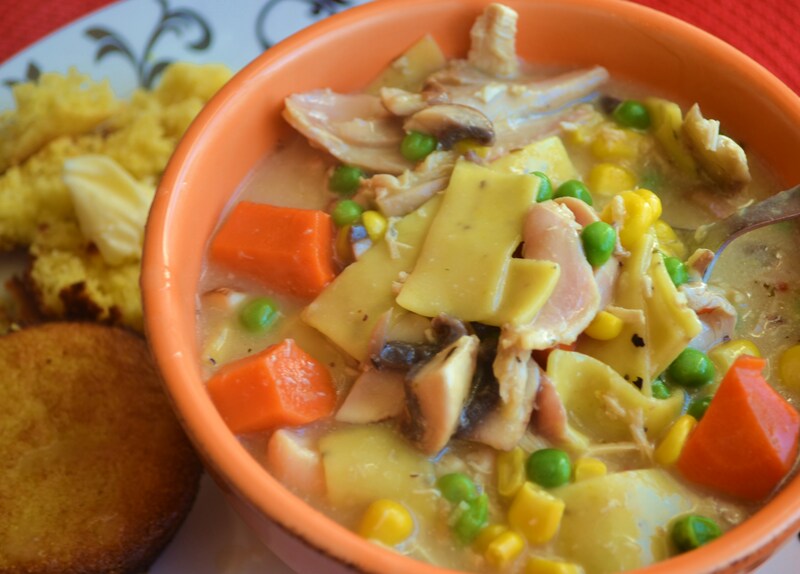 I believe this easy chicken soup will become your go-to recipe to serve on a chilly day, make for a sick family member or cheer up a friend with the flu. 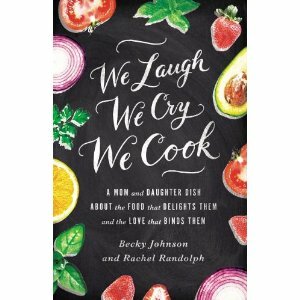 (You might also consider tucking in a copy of We Laugh, We Cry, We Cook for your friend. Nothing cures what ails you like homemade soup and laughter.) It is also easy to “veganize” this dish, and I’ll list alternative ingredients in the recipe below. *VEGANS can substitute a can of big butter beans or your favorite vegan chicken substitute for the meat. But add toward the end of cooking. In a big soup pot, heat the oil or oil/butter combination until it begins to bubble. Add flour and whisk this roux until smooth and bubbly. Very slowly, and while still whisking with one hand, add one cup of the chicken broth, stirring until smooth. Add the rest of the broth, the water, the milk and garlic, then continue to stir and let it come to a boil. Add the broken pappardelle noodles and carrots and mushrooms. Simmer this until the veggies and noodles are almost tender. Add chicken, corn, peas, seasonings and dash of hot sauce. Continue to simmer until noodles and veggies are tender (but not mushy) and heated through. Adjust seasonings to taste. 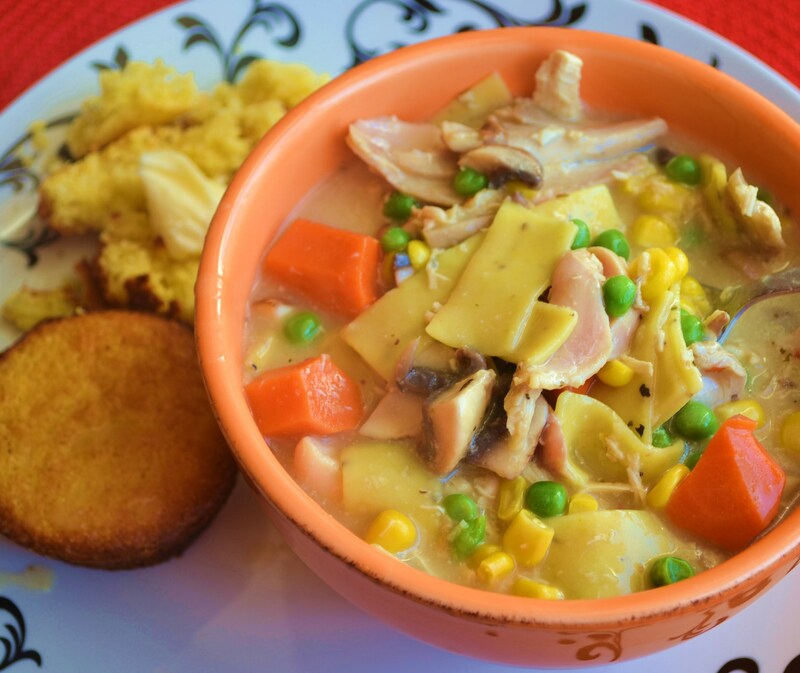 We usually serve steaming bowls of this hearty soup with hot buttered cornbread and fresh apple slices. 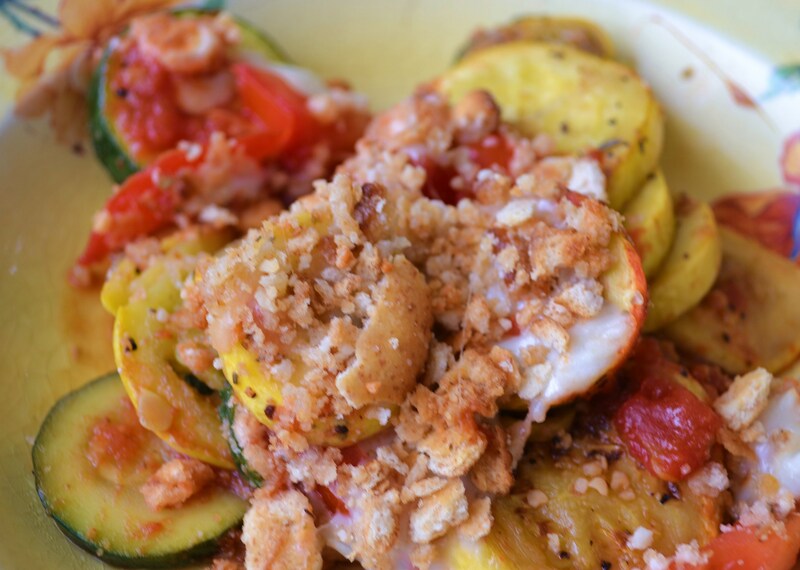 In my home state of Texas zucchini grows in backyard gardens with such profusion that almost everyone I knew had a steady pile of it sitting on the kitchen counter waiting to be washed, diced, sliced, grated, grilled baked, steamed, frozen — or ignored until it grew mildew and could finally be thrown away without guilt. My mother remembers having to remove a bunch of zucchini from my kitchen sink in order to make room to give one of my newborn babies their first bath. During Texas summers it is almost impossible to walk to or from your car without at least one neighbor strong-arming you into accepting a bag or bucket of ever present green squash. Everywhere you turn, zucchini lurks. 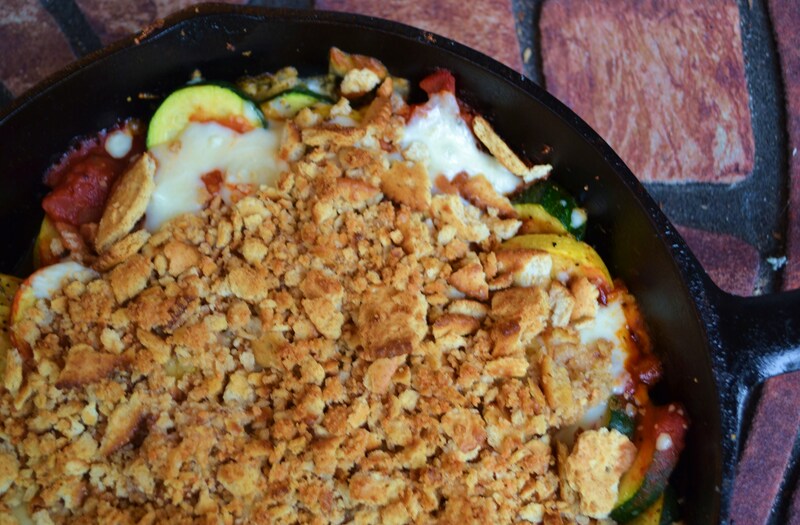 To get my children to eat their share of it, I invented Skillet Italian Squash Casserole. 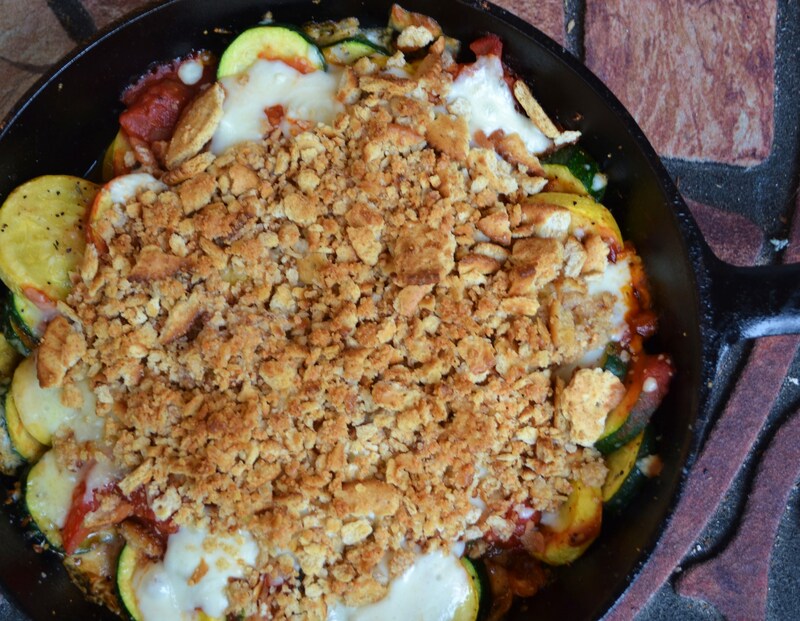 By cooking the squash until just crisp tender, then topping it with an Italian style tomato sauce, gooey cheese, and buttery crackers, I had a winner! It was a family favorite for many years. Slice squash about ¼ inch thick. Sprinkle all with salt and pepper. Heat oil in an 10-12 inch iron skillet on high flame until very hot. Put squash and garlic into pan and saute until many of the pieces are golden on the outside and cooked until just crisp-tender. Remove from stove top and pour crushed tomatoes evenly over the top of the squash. Sprinkle the tomatoes with oregano and brown sugar. Top with grated cheese. Melt butter in a medium-sized bowl in the microwave. Crumble crackers into the melted butter, add Parmesan and mix. Pour this crumb mixture on top of the cheese, then place the skillet in hot oven. 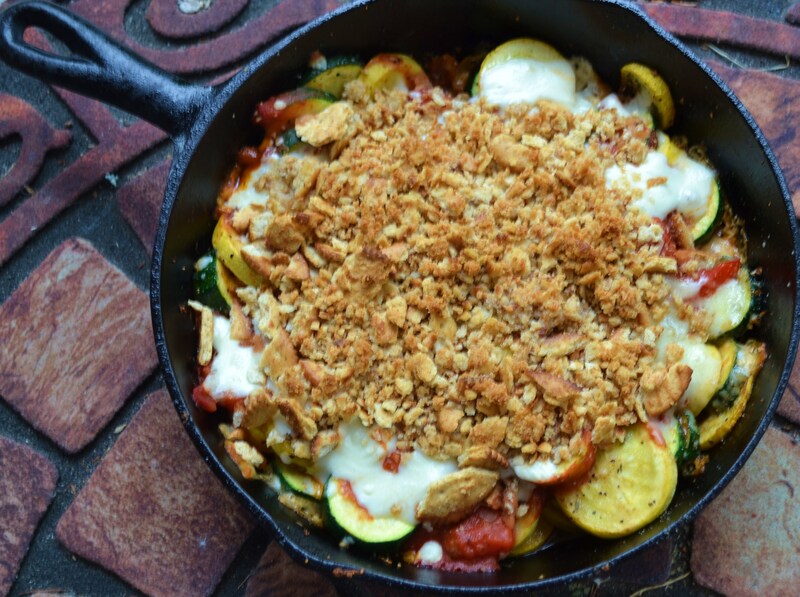 Bake for another 10 to 15 minutes or until squash is tender, cheese melted, and cracker crumb topping is golden. Veganize This: Substitute vegan ‘Mozzarella” and “Parmesan” cheese and dairy-free butter and you are good to go on this one. Simple to do! 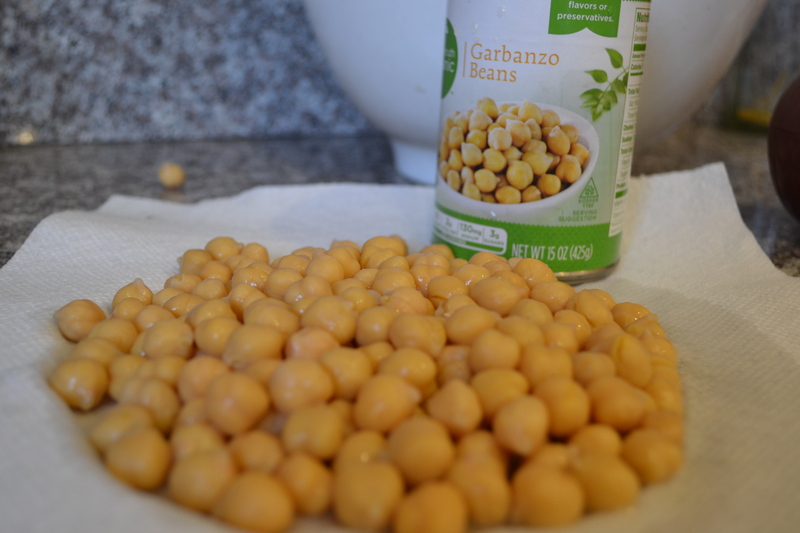 So, this is the story of how I ended up eating an ENTIRE CAN of garbanzo beans (chickpeas) in one sitting yesterday. My daughter’s slow and steady vegan influence upon me seems to have caught fire of late. Either that or I had some really awful meat-based meals last week. We went away to a hotel for fives days so that I could finish up my part of some detailed edits on our upcoming memoir, We Laugh, We Cry, We Cook. During my self-imposed confinement I ordered an “Asian Salad” from the hotel café –which turned out to be tasteless squares of chicken tossed in wilty Iceberg lettuce with a thick flavorless mayo-based dressing. Later, hope still afloat, I ordered a gyro, which was made from salt-less pre-cooked dry roast beef chips smothered a sauce that tasted of thickened water. I arrived home a few days later with a sudden and strange aversion to anything cut from cow or fowl. I almost kissed my fridge and pantry, so happy was I not to be at the mercy of restaurant cooks who are lacking in taste buds. Well, one idea led to another and by the time I finished, I created a snack that I could not stop eating until every single bean (or pea) was gone. 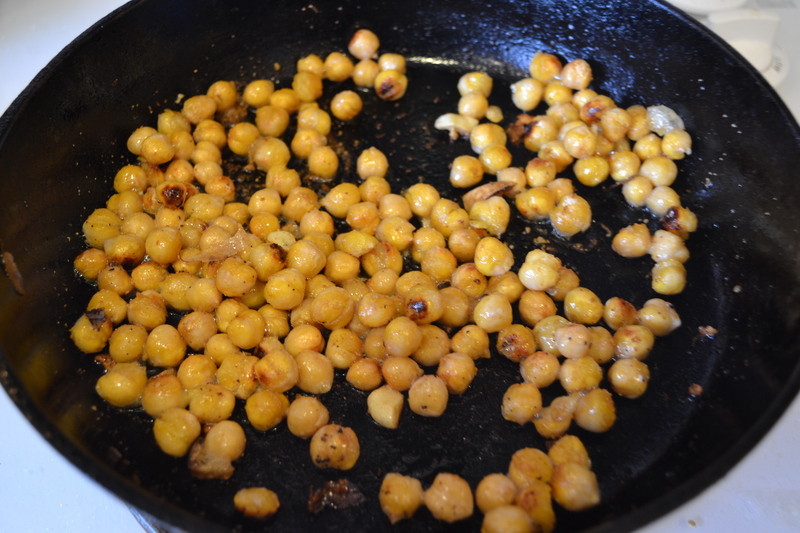 It began when I decided to try sautéing the garbanzos in olive oil in my trusty iron skillet. Then I threw in some sliced fresh garlic near the end of the cooking time so they could turn a golden brown (but not burn) and add extra flavor and crunch. After draining them on a paper towel, I squiggled a touch of agave nectar over them to give the beans and garlic a light sweet, sticky surface then sprinkled them with sea salt and Parmesan cheese. 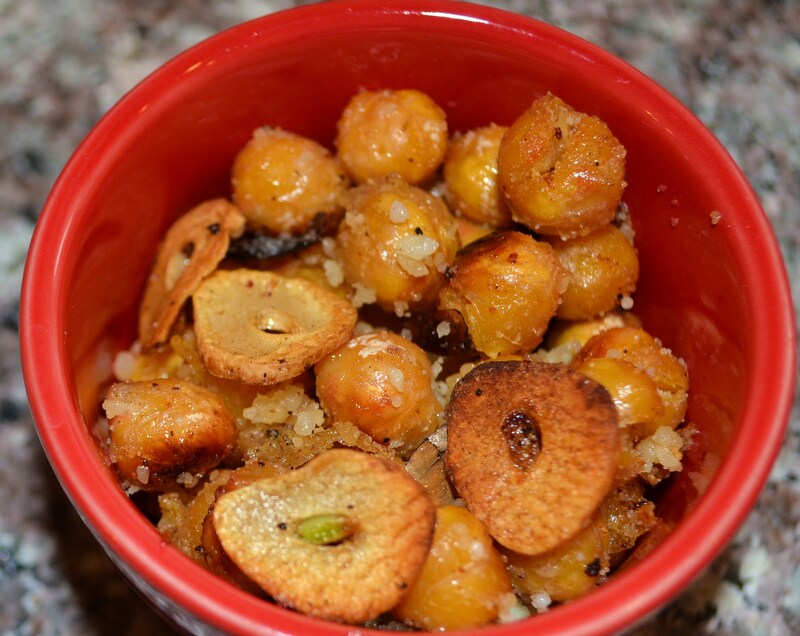 These little snacks have it all going on: some crunch, some chewiness, some garlic, some salty and savory, and just a hint of sweet. They can be eaten out of hand or tossed on a salad or atop a pasta for a quick vegan or vegetarian treat. 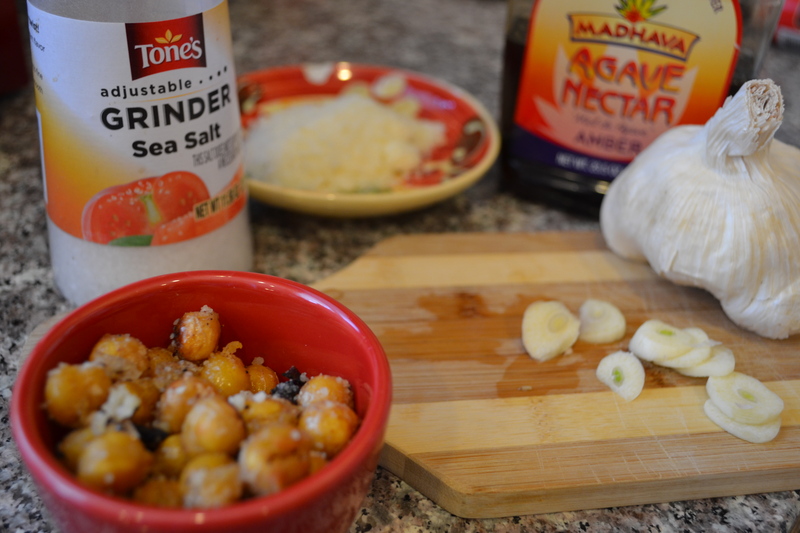 Drain the chick peas and garlic on a paper towel. Put into a bowl and gently toss with agave nectar. Add sea salt and Parmesan cheese to taste. Serve warm or at room temperature. Excellent source of protein and fiber atop salads, sandwiches or pasta. The first time I created and served this recipe for a patio party, guests kept saying, “Oh my goodness, what IS this yummy stuff?” I struggled to describe what is was, because, as is so often the case, I just put whatever sounded good to me into a pan and crossed my fingers. This recipe began with a pan of diced roasted Greek veggies that becomes a colorful, intensely flavored Mediterranean topping for wedges of hot grilled Naan bread, alongside hummus and a lemon-zest ricotta. If I were to be asked to create a “perfect bite” on some sort of home cook’s competition, I’d serve this Roasted Eggplant and Red Pepper Tapenade on top of, well, just about anything. I must confess, I am a little sad when there is not a container of “Yummy Stuff” in the fridge somewhere. It’s become my favorite condiment on top of fresh grilled Naan or Pita,burgers or sandwiches, or as a topping to punch up flavor in everyday spaghetti. If you are vegan, it’s especially nice to keep on hand to add a quick burst of color and flavor to lentils, beans, brown rice or quinoa. In medium to large skillet, heat olive oil. Add diced roasted Garlic Greek Veggies. Add tomato paste, vinegar, sugar, capers or pepperoncinis, sundried tomatoes, and olives. Stir and cook in skillet until sauce is thick, well-blended and hot and some of the “vinegary” smell and taste is cooked out, about 2 minutes. Add water if needed, but keep the tempenade thick. Serve warm, room temperature or even cold if you like. It is amazing on grilled Naan or pita bread atop hummus, fabulous as a thick relish-like topping for a Greek-style burger or any sandwich. 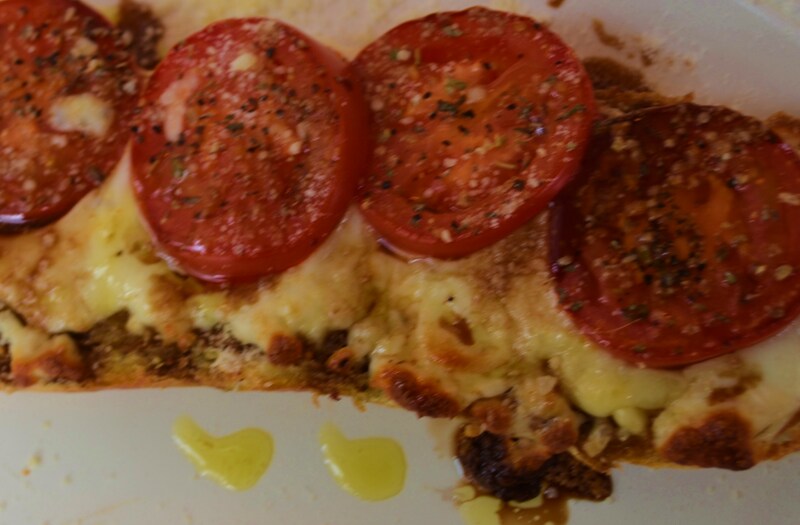 On a large baking sheet sprinkle olive oil and balsamic vinegar. Place chopped eggplant, red pepper and red onion on pan. Using clean hands mix the veggies with the oil and vinegar and then give the whole thing a light sprinkling of fresh sea salt and pepper. Put whole garlic cloves somewhere on pan either wrapped in foil or parchment with a little olive oil; or use a small clay garlic roaster. Roast veggies for about 20 to 30 minutes or until veggies just begin to get soft and brown-blackish in spots. Smash soft roasted garlic into a paste with flat edge of knife or fork, and toss with veggies. One of my most-repeated cooking mottos is, “It’s all about the sauce.” Growing up in Texas, pot luck suppers often provided informal competitions for whose mama made the best Bar-B-Que Sauce or home-made Salsa. My palette was set for big flavors at a young age. And I am still like a kid when it comes to tasty dipping sauces. 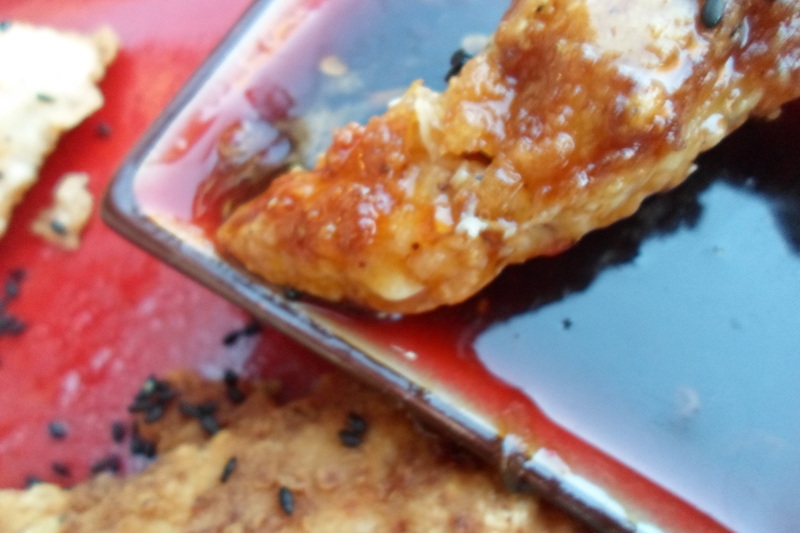 These spicy oriental style chicken strips get an extra crisp texture by dipping them in a mixture of egg whites and siracha, then rolling in seasoned flour and cornstarch before pan-frying in healthy coconut oil. 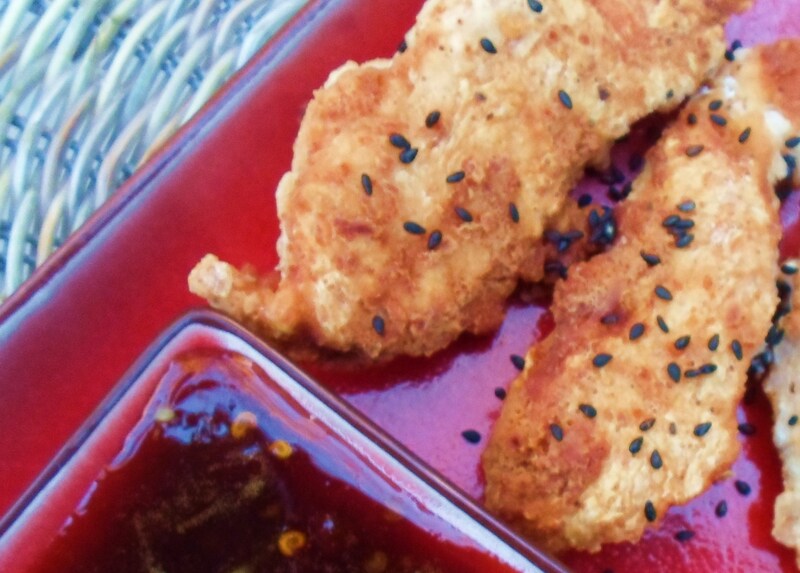 And wait until you try this sweet garlicky sauce made with honey, soy and a touch of molasses. So easy and only has to be heated to a boil then simmered for a minute before serving, but the depth and layers of flavor is amazing. Move over Colonel, I think I may have given a whole new defination to finger lickin’ good! Melt about 1/3 to ½ cup coconut oil in a large skillet, so that there is about ¼ inch of oil in the pan. Heat to medium high. Rinse and pat dry a dozen chicken tenders. Lightly salt and pepper them. In a side shallow bowl, mix egg whites and siracha sauce. In another bowl, mix flour, cornstarch, Cajun seasoning, grill seasoning and sesame seeds. In the meantime, in a saucepan, mix all the ingredients listed for the sauce. Heat to boiling, stirring occasionally, and then simmer for one more minute. Let cool a bit before pouring into small individual dipping bowls. 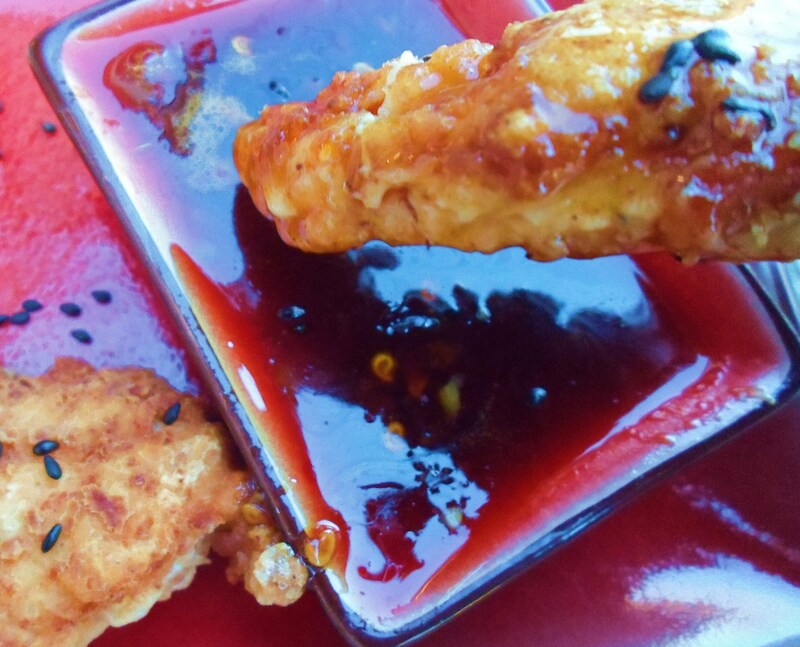 Serve each person 3-4 chicken tenders about 3 T. of dipping sauce. We enjoy this meal with brown jasmine rice and colorful stir-fried veggies as a side dish. Fresh sliced pineapple makes the perfect dessert.